A revised version of the controversial ‘Muezzin Bill’, which imposes further restrictions on the Muslim call to prayer, traditionally known as the Azan, in Israel and occupied Jerusalem, was approved for vote in the Knesset by Israel’s Ministerial Committee for Legislation, on Sunday afternoon. A draft of the bill, which suggested to ban loudspeakers over a certain volume at all hours, was blocked by ultra-Orthodox Israeli Minister of Health, Yaakov Litzman, for fear of a possible effect on the use of the weekly Jewish call for Shabbat. The bill was modified to prevent the use of loudspeakers by religious institutions only between the hours of 11 p.m. and 7 a.m., along with an additional fine of 10,000 Shekels (~2,670 USD) that, according to the Times of Israel, violators have to pay. The PNN further reports that the bill has to pass through three rounds of votes before it can be decreed and will be submitted to Israel’s parliament on Wednesday. Palestinian Authority (PA) spokesman Yousif al-Mahmoud said that the bill was a violation of freedom to worship in Jerusalem, highlighting that “the holy city in particular and Palestine in general had a history of respect and harmony between all residents regardless of their religious beliefs”. Al-Mahmoud added that ” it is unbelievable that the long religious and cultural history of the city is being destroyed with the stroke of a pen”. 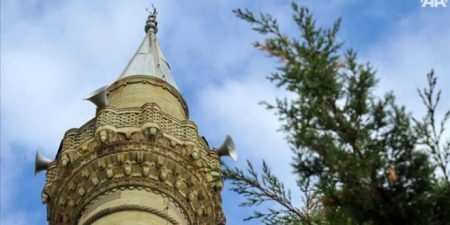 Earlier, in November, Israeli authorities banned the Azan over loudspeakers in three different mosques of Abu Dis, a Jerusalem-area district, after Israeli settlers from the illegal settlement of Pisgat Zeev had complained of ‘noise pollution’ caused by the Azan in a protest in front of the house of the Israeli Mayor of Jerusalem. He also condemned the bill as racism aimed against the Palestinians by the Israeli occupation government. “Such policies will only make us more committed to our rights and identity,” said the Hamas official. “The Palestinians will keep going until every single inch of their land is liberated”, he added.